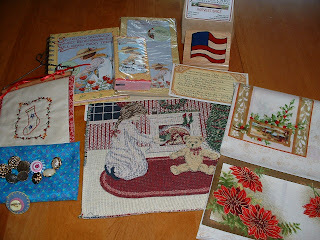 a swap by Karen Martin, was so much fun. Marsha over at Everybody Loves Clark and I had each other, but we didn't know it 'til our packages arrived at each other's houses, lol. 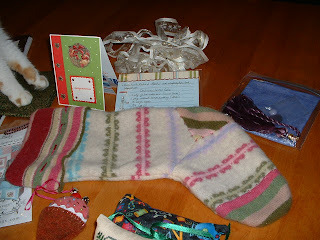 Marsha made me a gorgeous stocking made from a felted sweater and filled it with wonderful gifts. A felted ice cream cone that hides a tape measure, some frosted purple fabric, purple buttons, and a purple tassel (can you guess purple is my favorite color?) 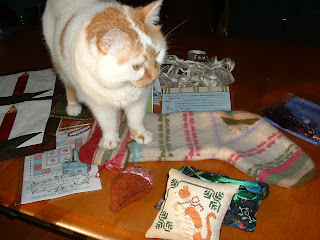 A fantastic cross-stitched kitty ornament that looks just like Katie (who thinks it's pretty cool, too). 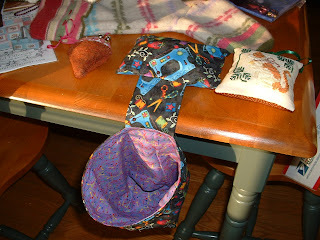 A wonderful scrap catcher that is now sitting on the arm of my chair so it can hold my embroidery thread scraps. 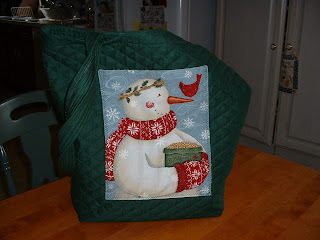 A pattern to make a quilt and a tote bag, a handmade card, and a yummy recipe for lemon cake. 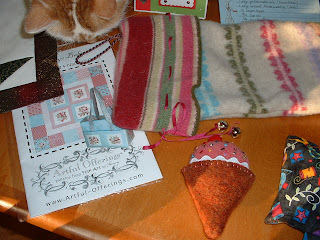 Plus, some gingerbread cookies and a wonderful candle wallhanging that will be perfect for the real Christmas season. What a super package to receive! 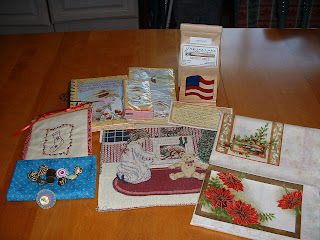 specialty coffee made in New York State, buttons, a recipe for Mary's pear salad, a flag rubber stamp, a tapestry Christmas patch, a blue fat quarter (her favorite color), a fabric panel with Christmas labels, Christmas tissues, Christmas pin, and a hand stitched Christmas ornament. 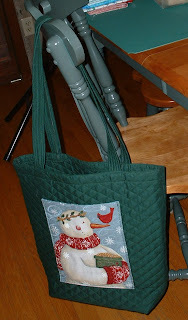 After I wrapped everything, I put them all in a quilted tote bag with a Christmas sowman on the front and mittens on the back. I was really pleased with how well my ornament turned out, since it was the first one I've made. 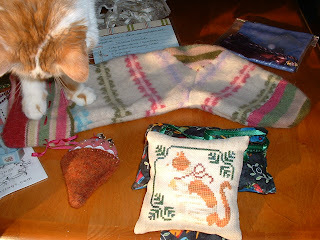 I just started stitching again after a 20-year break. 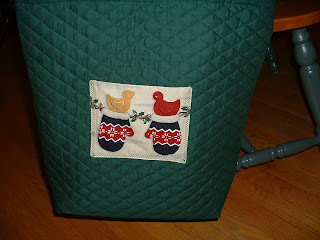 I'm finding a lot more satisfaction in embroidery stitching than I ever did in cross-stitch or crewel. Of course, it could be the time of my life, too. 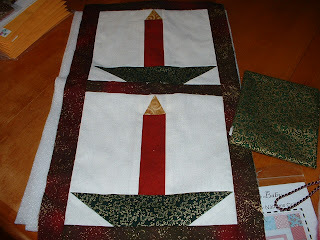 When I was younger and working, I never had the time to sit and stitch. Now, I can relax with my friends and chat and stitch. It's a lot more fun now. 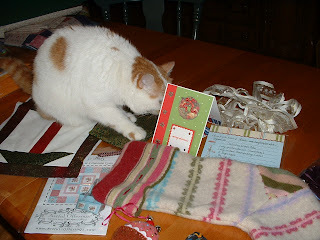 I'll leave you with one more image from Christmas in July: Katie snooping to see if she's missed out on anything. How fun! I love Katie's ornament! So glad Katie likes her ornament. I had fun changing the threads to try and make it look like her. 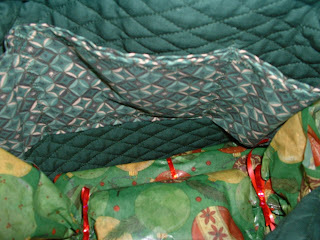 I love all my presents, I'm afraid I forgot to mention a few. It was a great Christmas!